Hooray for Comics: eeek! MICE!!! That's right folks! 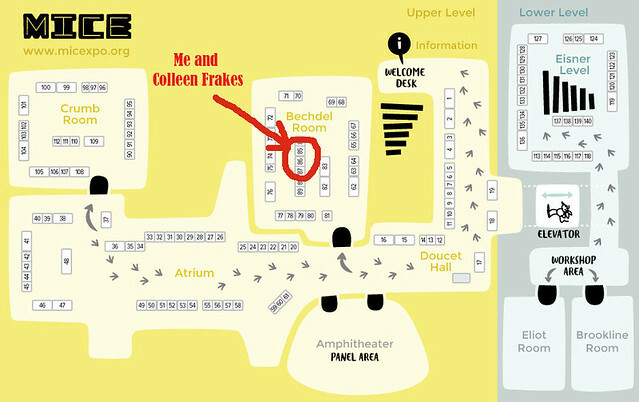 I'll be tabling next to the one and only Colleen Frakes at the Massachusetts Independent Comics Expo (aka MICE) this weekend on October 29th from 10am-6pm and October 30th from 11am - 5pm at University Hall at Lesley University 1815 Massachusetts Ave (Porter Sq. )It's free Admission and I'd love to see you my Boston and New England friends!!! Here's a handy dandy map of where to find me!! My daughter is a die hard fan of comics. She would definitely love to know about your posts. I will share it with her asap and do post some more interesting and cool stuff on your blog.